Much of Slovakia is covered by mountains and forests and hence it’s no surprise that we Slovaks love the outdoors. Many of my memories from my childhood are of going on hikes with my dad. 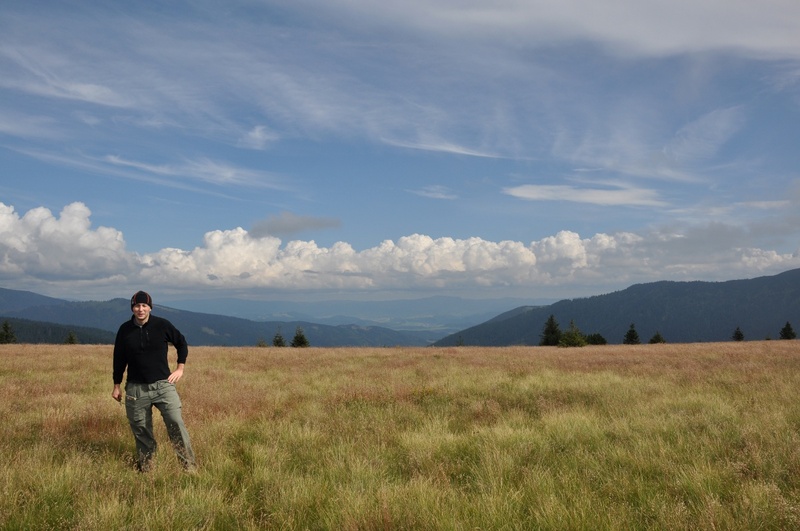 We usually did short day trips in the peaks surrounding my hometown of Banská Bystrica. Sometimes we even grabbed a basket for wild mushrooms. Mushroom picking is a common companion to strolling through the woods. I left Slovakia in 1994. Although I’ve been coming back almost every other year, these trips are always too short and always spent visiting the family. This leaves no time for getting back to the Slovak wilderness. So this year, I decided to correct that and explore my native Slovakia with a backpack on my back. I thought it would be really neat to hike all the way across Slovakia, spend each night in a different village, and collect stories, traditions, and recipes. And write a book about it. 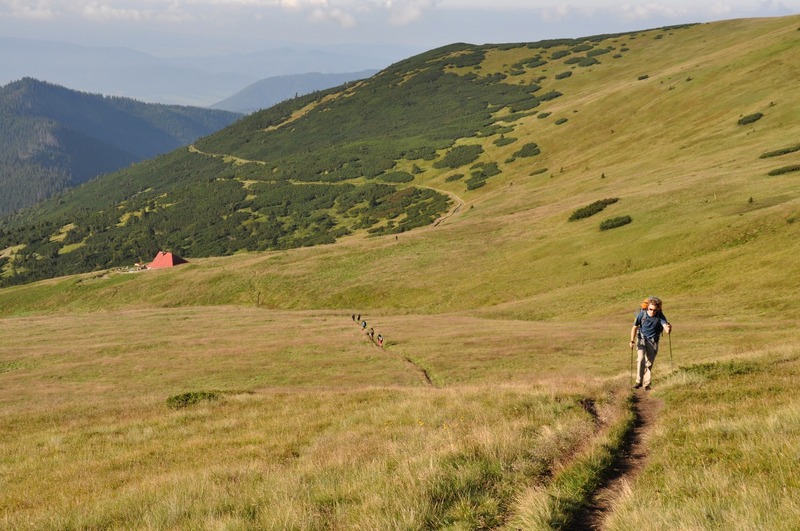 This is actually possible – Slovakia has its own version of the Appalachian Trail. This red-blazed trail, called Cesta Hrdinov SNP, Route of the Heroes of the SNP (SNP is the Slovak National Uprising against the Nazis), travels for 450 miles from Bratislava to Dukla, a mountain pass on the Polish border in eastern Slovakia. This pass witnessed one of the heavier battles of World War II. The route commemorates the guerillas who fought the Nazis by hiding in the mountains and launching ambushes against the occupying soldiers. 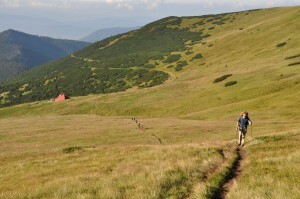 The trails visits the farmlands and the mountains, and stops by the many villages that dot the Slovak countryside. This SNP route is actually part of a much longer trail, the European E8 route, which travels for 2920 miles from Ireland to Turkey. But doing this trail would take a solid month. It would also skip many of the famous parts of Slovakia, such as the High Tatras, or even the Slovak Paradise proper. So my friend Alex, my hiking companion on this trip, and I decided on a plan B. Instead of doing a single long hike, we would do several shorter trips, but visit all the major parks. Our trip consisted of four legs. The first leg was the longest. It was the through-hike of the Low Tatras. This hike is called in Slovak prechod hlavného hrebeňa Nízkych Tatier, which translates as the crossing of the main ridge of the Low Tatras. This part took us five days. This was in a sense an introduction to doing the whole Route of SNP – in fact, it is in fact the same trail. In this post you’ll find the first set of pictures from this through hike. We then headed to the High Tatras, a mountain range full of exposed craggy peaks, and did couple day hikes there. We then spent few days in the Slovak Paradise, a rugged park famous for via ferrata type routes. The final leg was a visit to the Pieniny region, and rafting down the Dunajec river. 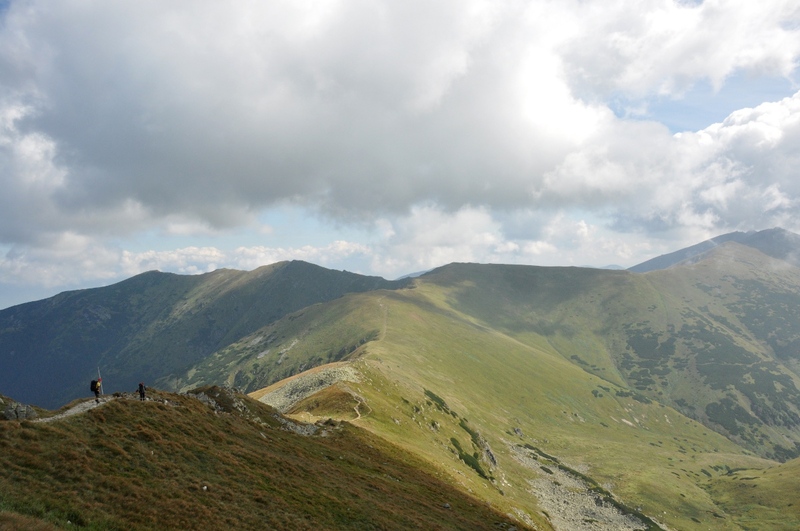 Hiking in Slovakia is pretty low-key. No special permits are needed and hiking maps are available in all bookstores. Every town also has a good selection of hiking stores (usually called something-šport) and there is a plenty of trails to choose from. However, the main issue and our main frustration when planning this trip was simply the lack of information available outside the country. And I am talking of info available in Slovak. If you want something in English you are definitely out of luck. For instance, here in the US, all national parks have websites full of basic information on access, camping, and so on. It seems that the Slovak park service has yet to make the transition to the online world. The major thing we could not figure out were the camping regulations. In many parks in the US you can pitch your tent anywhere as long as you are some minimum distance away from the trail and water. Not so much in Slovakia. Turns out that in the Slovak national parks camping is allowed only at specific designated huts and their surrounding area. Because of this, your daily starting and end points are completely determined by the location of these huts. 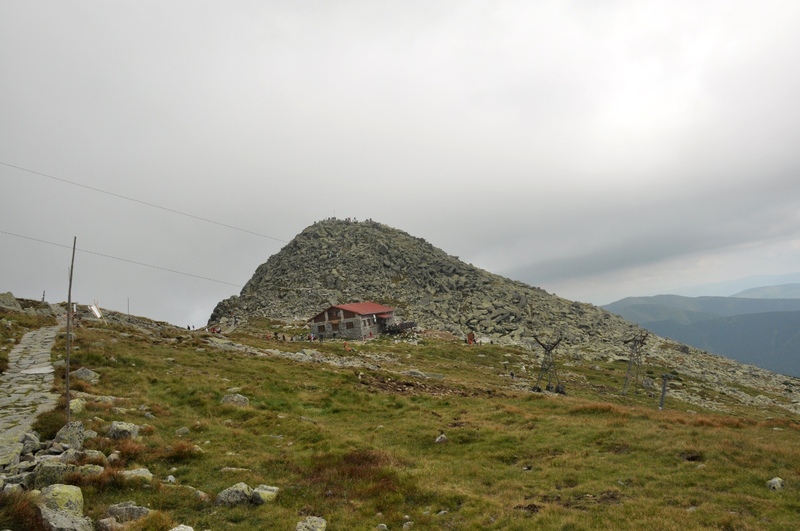 In the Low Tatras, these huts are sufficiently far apart to make it pretty much impossible to skip one. Hence you hike from a hut to hut. But the upside of this is that since you keep seeing the same people every day and night, you’ll quickly make new buddies on the trail. We knew these huts existed but didn’t know how full they got, or even whether we will actually want to stay in them (this was before we knew about the no-camping regulation). I personally prefer to sleep outside when hiking. I get better sleep and it just seems more natural and more fitting. So we brought with us our camping gear. Alex really wanted to sleep in a hammock. He got into this huge hammock obsession before the trip and for a while he even toyed with the idea of renting out his house and living in the back yard in a tree. I didn’t feel like carrying a tent, so I settled on a bivy sack. Bivy is basically a waterproof body bag, sort of like a one person tent minus the poles, and totally hard-core. We flew into Slovakia on August 12th – or at least I did. I got my dates mixed up and bought the ticket for one day prior to Alex’s arrival (we flew with different companies). But this actually worked out great. It gave me some time to catch up with my sister Petra who is living in Bratislava. The next day we picked up Alex and spent the day sighseeing in Bratislava. Alex was feeling pretty messed from the flight/time change so he didn’t get much out of it. The next day we took the train to my hometown of Banská Bystrica. That was our staging ground. We stayed with my dad. The following day, on Monday, we went downtown to get ready for the hike: maps, food, snacks, gear, etc.. We stocked up on dehydrated goulash soups, various noodles, peanuts, apples, and various wafers. To a great horror, Alex realized that peanut butter is not as common a staple in Slovakia as in the US. My suggestion of Nugeta (a Nutella-like cream) didn’t sit with him well. In the end, my half-eaten jar of peanut butter brought in from the US ended up switching place in my backpack with his Nugeta. Although I don’t normally eat peanut butter, it is a great hiking companion. It is easy to eat and super dense in calories. The gear we bought were the gas canisters for our stoves. These cannot be carried on airplanes due to safety reasons. But we had no issue finding them, they even come in the Coleman brand. The through-hike of the Low Tatras basically follows the red-blazed Route of Heroes of SNP along the ridge of the Low Tatras. One end is in Donovaly, a ski resort village just a short drive from Banská Bystrica. I suspect that the official start of the through-hike is down in the town. But, seeing the steep ski hill, and having my dad and his car at our disposal, we took the easy way out and got dropped off at the top of the road, in a little village above the ski slope. We hit the trail sharp and early at 8:30 am. The first hour was spent hiking in the woods. I was familiar with this area since I came here last winter for a ski trip and one day we went for a little hike in the snow. After the hour, the forest broke away, and we started the climb up a prominent ridge called Kozí Chrbát (goat’s back). On the opposite end, we descended down a steep and muddy trail. One thing we quickly learned that Slovak trail builders don’t really believe in switchbacks. I have done a lot of hiking in the US, but I have never seen trails this steep. This is the map of our hiking route for days 1 and 2. Banská Bystrica is the town I grew up in and where my dad lives. 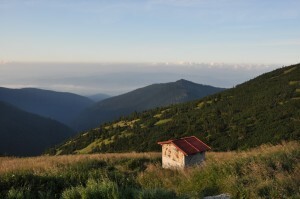 We have a cottage in Dolná Lehota from where you can get a great view at the Low Tatras on a clear day. Map from freemap.sk. And we are off – our first red blaze. We’ll be following these for the next five days. And also a bodliak, or a thistle. These are very common in Slovakia. Soon after we got up to the ridge, a flock of sheep started following Alex. It was such a fitting start for this hike! The clouds also started to break soon after, and we got our first view of the scenery. All this time, we were in a dense fog with temperatures maybe only in the 50s. It was definitely much colder that we had expected. It was bitterly cold and windy up on Prašivá (the “Dusty”), a prominent peak in the Low Tatras. Zet somewhere around here we ran into Sandals, a Czech couple also doing this hike. 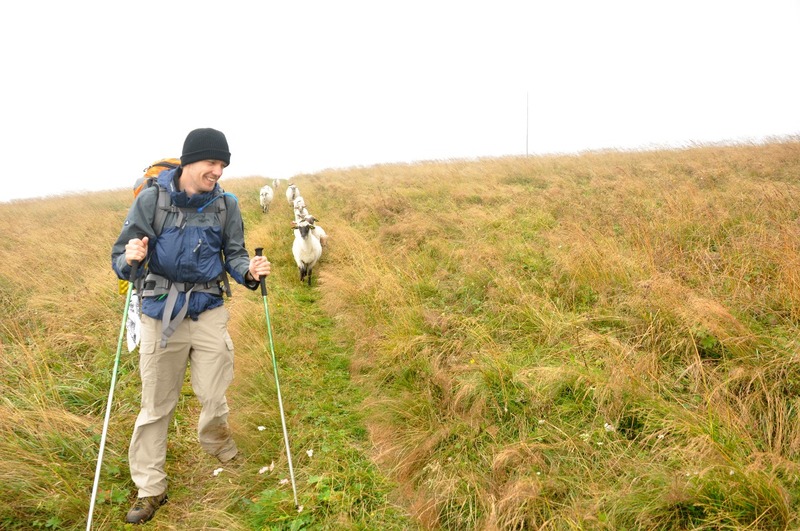 While Alex and I were bundled up in our Gore-Tex jackets, these guys were hiking in shorts and sandals! At around 3:30pm we have arrived at a junction with the blue trail at the Valley of Latiborská Peak (Sedlo Latiborskej Hoľe). This was our possible camping spot. We figured that if we get here after 4 we’ll camp here instead of pushing to the hut. Well, we beat our deadline by 30 minutes and hence we pressed on. At the junction we saw a little shelter in which bunch of guys were hanging out. Later we found out these were the Hungarians, a group of 4 companions we would see on our trip. started making good time this second half of the day. We got to the hut below Chabenec at 6:30pm, exactly 10 hours after start. The guide we were using to plan this hike had the time at 9:30 so we did quite well. When I got there, I asked for Ďuro Šikula. He is a friend of my dad and dad called him prior to our leaving to ask him to save us some room in the hut. Ďuro used to be in charge of this hut. He told my dad that of course, he’ll save a spot for us. So it was a big surprise that we were told when we got there that Ďuro hasn’t worked there for about 6 months. But no problem, there was plenty of space. These little blue flowers are called horec. They are very common in the Slovak mountains – and also on horalky. 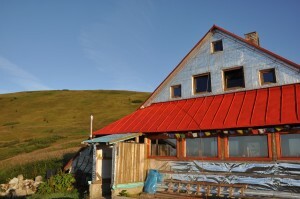 This first hut, Útuľna pod Chabcom (also known as Ďurková) is a large hut with a red roof located a slight distance downhill from the saddle (sedlo) below the Chabenec peak. It consists of two floors. The first floor has a dining area, and upstairs is the attic. This entire attic is basically one giant room with pads on the floor. As you can imagine, it was quite hard to sleep with the constant movement and chit-chat. In addition it was really cramped and hot. To conserve room, pairs hiking together were put together on a mat about the size of a twin-bed mattress. This didn’t leave much room to turn around. But the nice thing about this hut is that it has a fully staffed kitchen with great food, and best of all, beer! Strolling into a hut after a long day of hiking, and sitting down with a hot soup and a cold beer is not a luxury I usually get in the States. We ended up eating šošovicovú polievku, lentil soup. I also cooked some of the noodles I brought along. This was our first hut. What an amazing view from the toilette! My grandma’s village is somewhere down in those valleys. The next morning, leaving the hut behind. The second photo is on top of Chabenec, 1955m (6400 feet). It was a much nicer day today! Blue skies in the morning. We headed up Chabenec and later Dereše. Up here we saw a group of some 20 wild mountain chamois, kamzíky. This was my first time ever seeing these guys in the wild. They are basically the size of small deer, but with horns. These mountain goat-antelopes were going about their business grazing in the middle of the trail, totally not minding our business. We had no idea if they were friendly so we just stood around for a while contemplating what to do next. Alex suggestion of me charging forward while he records a video didn’t quite sit well with me. About 10 minutes into this indecision, Glacier Goggles and his girlfriend Cig (those are the nicknames we gave them, of course) showed up. They marched right through which made our standing around look probably quite ridiculous. The goats got off the trail and hopped up some rock formations. It was a very impressive sight. Our first kamzíky, chamois! This was the first time I have seen these mountain goats in the wild. 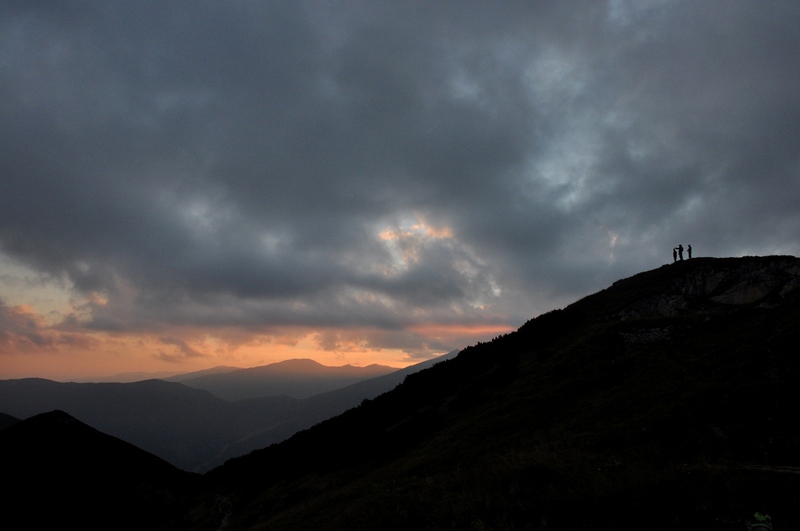 Another shot of the amazing Slovak mountain scenery. 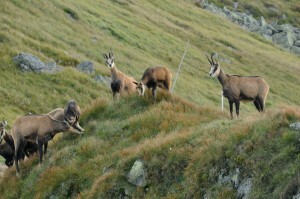 And more chamois. but got here in time to push towards the real goal for the second day, the hut of Milan Rastislav Štefánik. We were quite beat by the time we got here. However, the hut fixed us right up – inside the hut is a full-blown restaurant offering all sorts of traditional Slovak specialties. What a treat. 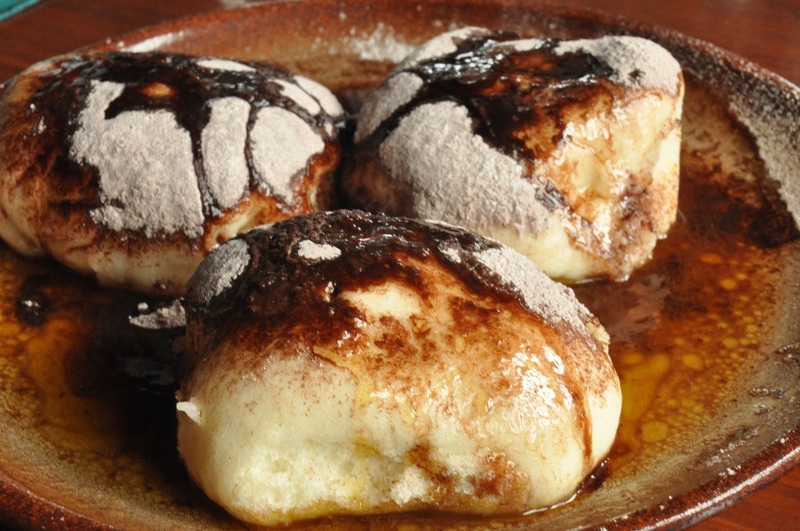 We had kapustnica, vypražaný syr, buchty na pare (filled with strawberry jam), and haruľa. Before we got in the hut, dark clouds started forming on the horizon. These were the sorts of clouds that gave us a pause, since in Virginia they would surely be followed by a thunderstorm. However, these clouds seem to be a normal daily occurrence here in the Low Tatras. We saw these clouds form every day but they always passed by. In fact, during the five days we were on this trail, we got rained on just once – and only for about 15 minutes. We lunched until 3pm and by then the dark clouds passed by. 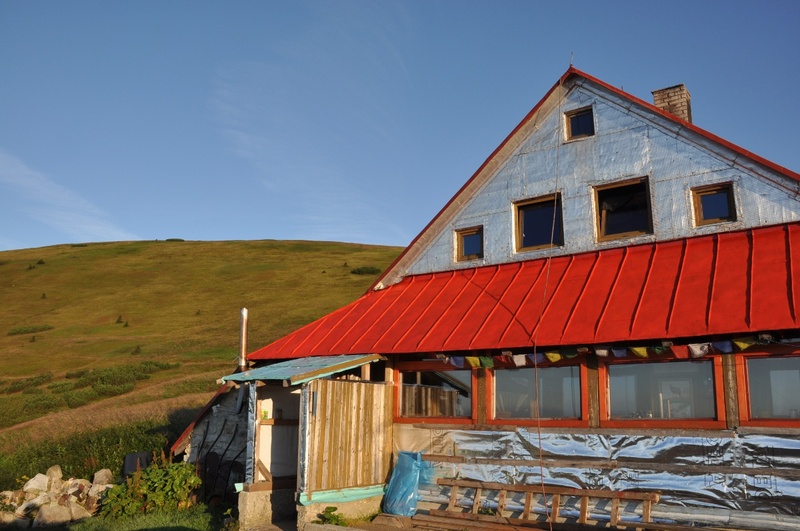 We skipped climbing Chopok and Ďumbier and pressed towards the hut. This last section was very rough on feet. From Dereše to Ďumbier the trail was mainly on packed tallus. Some sections even had a nice “paved” rock path. Not much so after Ďumbier. This section was full of large rocks, so instead of walking, we were doing much jumping from a rock to rock. 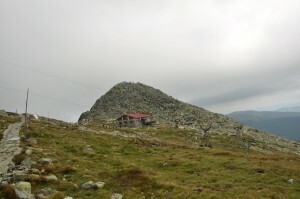 The hut, Štefánička, is named after a famous Slovak general from the First World War, and one of the major players in the formation of the first Czechoslovak Republic, Milan Rastislav Štefánik. This hut was great – bit too luxurious for a stroll in the woods even. We got checked in by a really pretty girl with a rather low cut shirt. This hut is more of a hostel, with individual room for 8. There are even showers on each floor, however, the hot water was definitely not working as advertised (it was so hot my teeth were shattering). Downstairs is a restaurant and also an outside picnic area. We first cooked some dinner – at least I did. I made some of the goulash soup while Alex grabbed some fried cheese with fries. Later we went and shared a beer with GG and Cig. They are a really nice couple. They spent a year in New Zealand for a year and just recently got back to Prague. You can read more about their adventures on their blog. They figured that before they get back in the full swing of having a job, they’ll do one more hike. 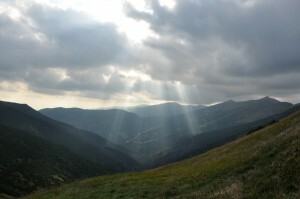 It seems that this through hike of the Low Tatras is actually very popular with the Czechs. We only ran into a single group of Slovaks – and that was the last day. Chopok with the Rock Chateau (Kamenná Chata) in the foreground. We had delicious steamed dumplings there. 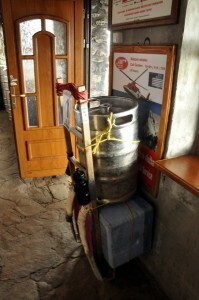 This is the carrier the porters use. Good to see this guy has got his priorities straight. We need more beer! Here is Alex and I at Štefánička. Beer and an awesome view – what a great way to end your day. Continue onto part 2: Štefánička to Telgárt. Hi folks and greetings from 41,000 ft above St. Louis on a flight back to Baltimore (as I write this). I’ll try to get the second half posted tomorrow and the rest of the hike the following week. 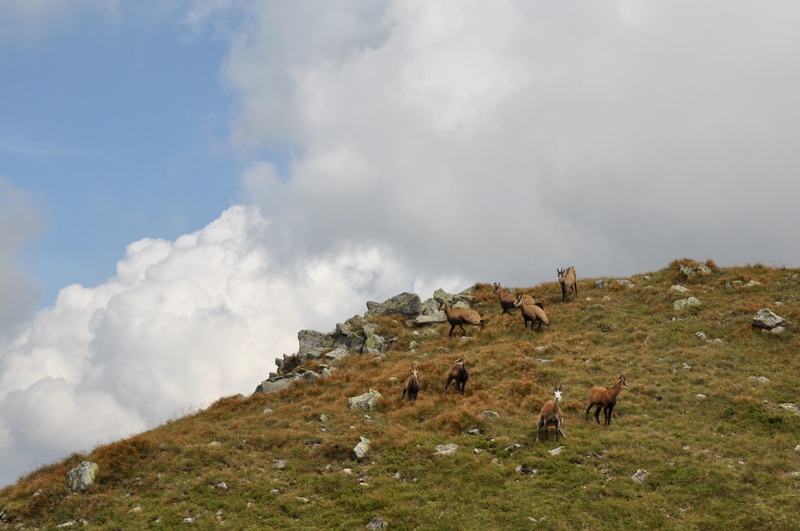 I saw your blog (just the first two days) of hiking in the Lower Tatra Mountains. I’d love to see the whole thing. Yes! I agree, there is so little about it online – in English anyway. Know where to start from? Know the distances between accommodation/huts? know how much food to bring? 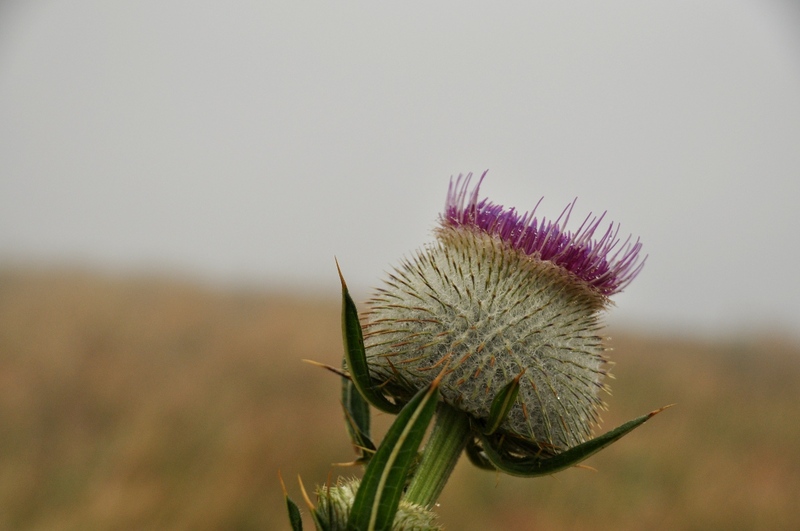 Costs of accommodation in the mountains? And how long does it take between huts? What does one need to bring on the hike? Should we bring cooking equipment? Bedding? What bedding? What is provided in the huts? Can one buy food on the way? Hi Caroline, it may be easier if you let me know exactly what route you are planning to do. 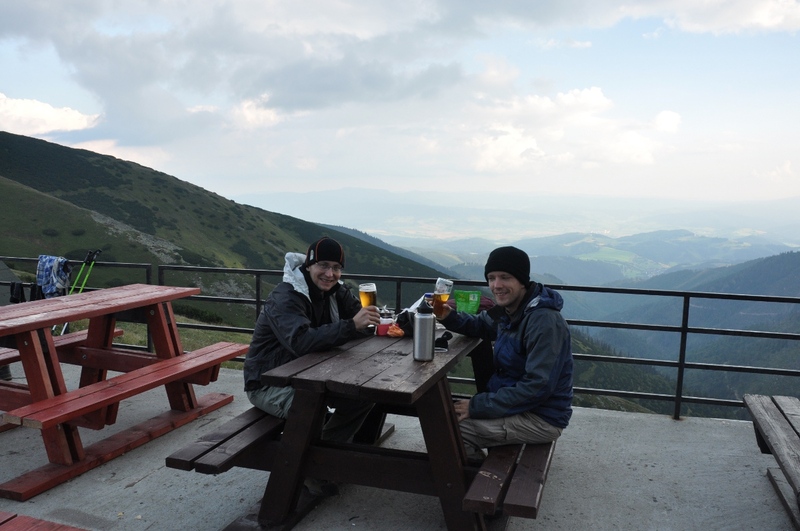 If doing the same as here (the through hike of the Low Tatras) then you can probably just follow what we did. We hiked at a fairly relaxed pace (maybe 2 miles per hour) and had time to stop along the way for lunch, pictures, and got to each hut before sunset. The only huts that had food were the first two. You can also buy lunch at the Kamena Chata on top of Chopok. Otherwise, pack just as you would for a backpacking trip, except that you don’t need to bring a tent. Dehydrated soups are very popular in Slovakia and make for a good first-course. I don’t remember now what else I ate but probably some noodles. Thanks Lubos. We are going on the Lower Tatras, but not sure where to start. What route did you take? I only saw Part one of your blog, so don’t know the route you took. I’d appreciate guideline for the route. Where did you start? and End? Where does one catch a train to from Bratislava? Also, do the huts provide bedding? Do I need to bring bedding? Where can I find a map? I know I can get one in Bratislava in hiking shops, but it would be nice to have one before we get to Slovakia so we can plan. Any map I’ve seen online is not clear. Thanks, looking forward to read and see more pics of your trip. Thanks so much for sharing, beautiful photos and cool experience — can’t wait for Part II. Thank you , this brings back some wonderful memories. I was born in Mokra Luka cast revuca. I came to America in 1948. Thanks for the writeup. I so wish we could convince more American Slovaks and others, to visit This beautiful country and be witness to the diversity of the landscapes there. We are so blessed to have it available to us and I wish to share this beauty as I know you do and have done. Beautiful photography, great comments – thanks for sharing all, and the photo of BUCHTY made my mouth water! I’m considering walking through the Low Tetras later this year and your posts have been the best resource I’ve found so far. Your writing also makes me want to leave tomorrow! I hope to stay in the huts but I can’t find much information regarding their cost etc. How much does a bed and food cost? And did you have any trouble finding space or needing to book ahead? HI Megan, did you ever get the information you asked about on Jan 22, 2013? Precisely my questions. Did you ever get to the Tatras? 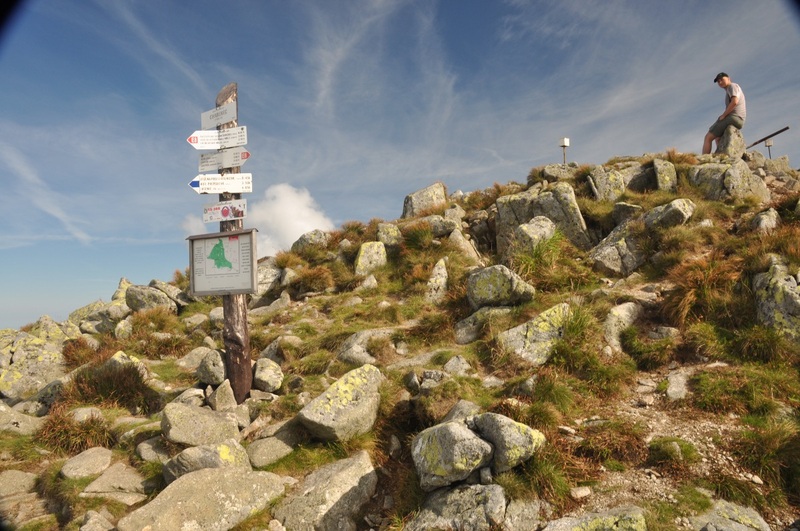 I woder if you could advise me… I’m planning a trip to the Tatras in June but have heard that some trails are closed. Are there enough trails open for a worthwhile trip? Louise, my family lives in that area. As I know, winter was really bad and they had a record snowfall in a history (as folks can remember) I think that’s a reason why some trail may be still closed at this time. However, if you plan to go in June, it’s should be OK, July shoul be no problem at all. you should be OK in June. Only high passes may be closed until June 15, but that would require extreme hiking (just abould only 5% of hiking trails) ther rest you should be able to enjoy through the whole June (unles some unpredictable weather stuff happens). That’s info I’ve got from family/friends back in Slovakia. and it says the trails are all closed until June 15th – I don’t want to turn up to discover everything is closed! I’ve heard that the trails on the Polish side might be ok though – is this true? I’m flying into Krakow and plan to go to Zakopane first, then hopefully over to Slovakia. Thank you for all the help! In High Tatras most high elevation trails are closed till 15th of June. But after 15th of June you should be OK. They say closure is due to environmental concerns. 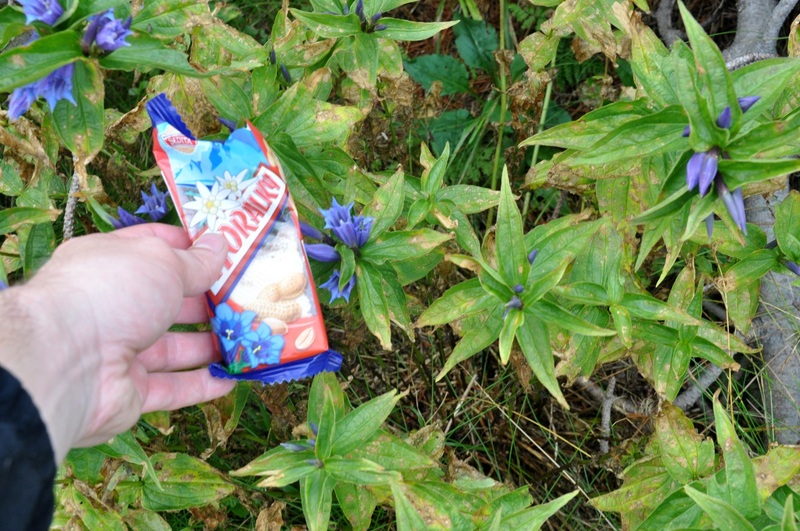 High Tatras are overwhelmed by turists/hikers in summer month and they try to let environmet to “recover” especially in spring months. I don’t blame them. But as I said in a secon half of June you should be OK.
Any good day hikes around Tisovec. Iam an American of Slovak descent visiting the area to get a feel for my roots. Grandma always talked about the low Tatra, so tomorrow I will be there. Yes there are but I am not too familiar with them. But the funny thing is, I also live in Falls Church and may actually need a dentist! Hi. Liked your post a lot and had some questions. My second comment is about timing. You said “sometimes this year”, if so, you better hurry as you are running out of time. It’s getting cold (even freezing at night at higher elevation) and October will be even worse, and I would not consider November through the winter. Of course it depends what kind of hiking you want to do. Backpack multi day trekking is not good later in the year, however day hiking trips are fine, unless it starts snowing, and November is highly suspect for snowing at Donovaly. My friend and I live in Vienna and we were thinking of getting the train to Banska Bystrica, then spending a night there (or in Donovaly), before we start hiking the next day. You mentioned how you took your dad’s car and drove up to a village above the ski slope to avoid walking up the ski hill? If you want to take a cab or something from Donovaly and explain the driver that we want to go pass by Donovaly and get to this village you mentioned above the ski hill, what do we tell him/her? Sorry! I just saw the comment right above mine! One thing I wanted to ask. We checked hiking in High Tatras in the winter and they said they usually close down the top part of the hiking route through Mt. Rysy. Would the routes in Low Tatras be closed too in the winter time? We are also planning on just camping outdoor, but we heard it was illegal in Slovakia. Anyway, the whole plan is to start from Donovaly and get to Telegart, then take a bus or train to Poprad, where we can get to Poland (we’ve done High Tatras around Mt. Rysy last year). It’d be great, we can get some suggestions or any general comment on the plan really. Thanks! 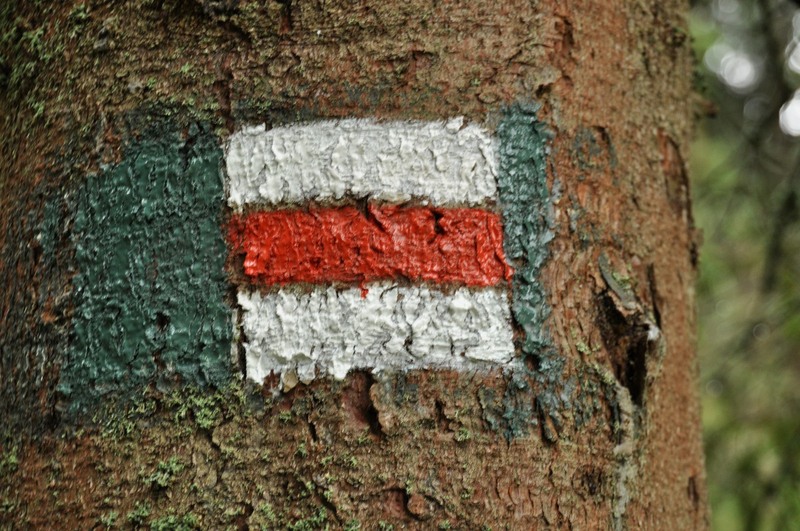 Ah one more… Is there any map with trails marked we can find? We got a map here in Vienna, but it doesn’t really say much..
Hi Byeong, we bought our maps in Slovakia. Many bookstores carry topo maps, and if you don’t find them there, then definitely in a hiking store. 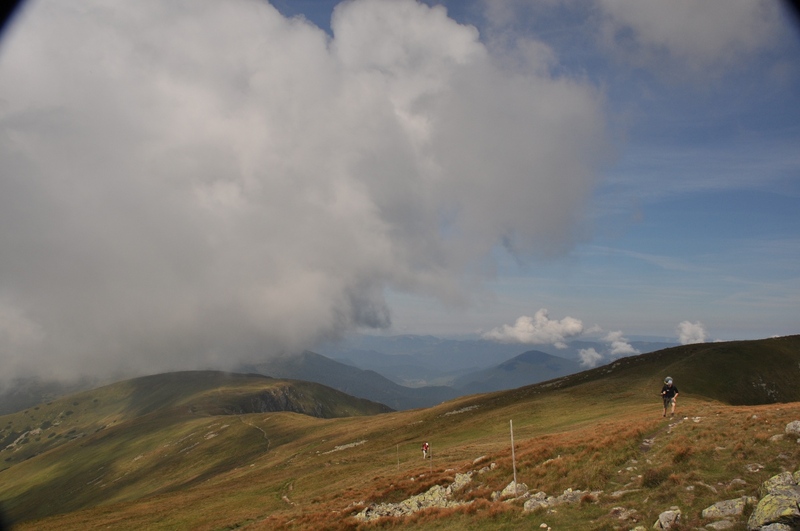 There are tons in Bratislava and also in Banska Bystrica (we Slovaks love to hike!). Not sure about access in winter, but I imagine the conditions would be quite brutal and you will likely need crampons and snowshoes. I recommend you don’t try this until the snow melts. Alright. Cool! Thanks a lot! Hey. My friend and I just got back from the Low Tatras. 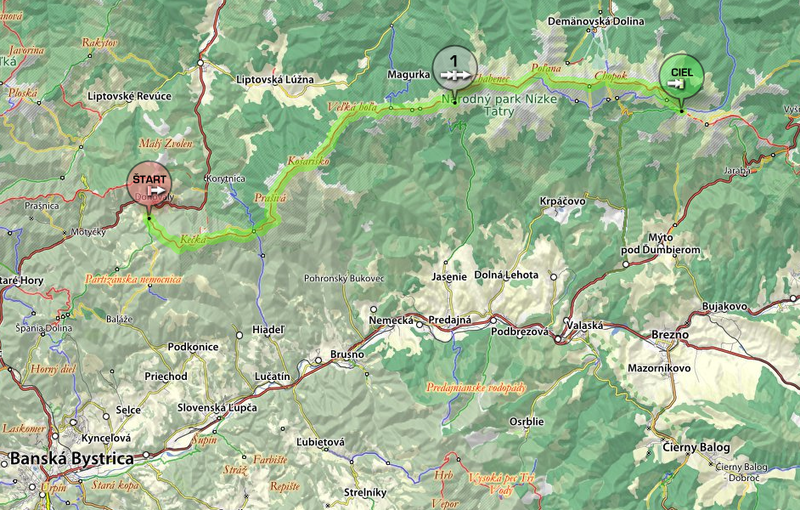 We didn’t have enough time to do the whole trail, so just decided to check out Banska Bystrica and Chopok the next day. We got a bus and ski lift up Chopok and walked from there to Chata M.R.Stefanika and, as you said, the conditions were indeed brutal. 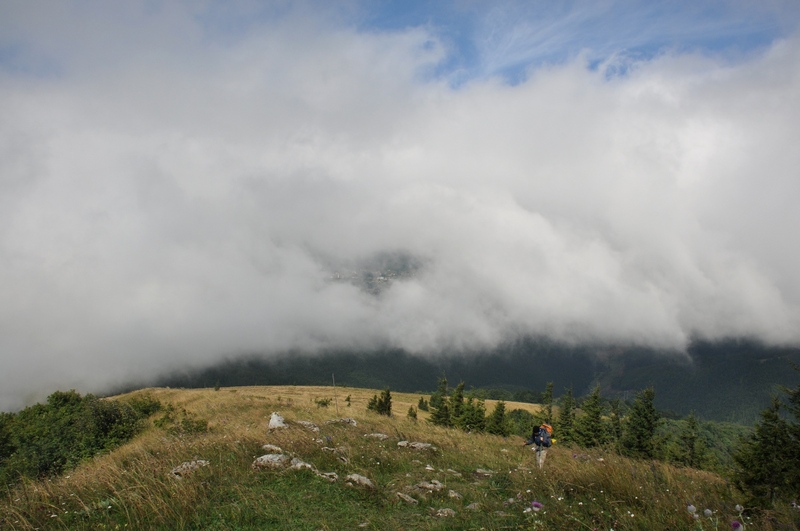 Walking between the two peaks before descending towards Chata M.R.Stefanika was a near death experience. It was awesome though! Definitely going back there, when the weather gets better.